The way the number of internet fraudster is increasing this day you may have to go beyond using a just single password to protect your account online. I almost fell a victim with my Gmail account today when an unknown person tried to access it and change my password. The hacker almost succeeds in doing it until the hacker got to Gmail two-step verification I set up in my account with a different password. If you are not using the Gmail 2-step verification, kindly permit me to say you are wrong. There are a lot of features Google has hidden in your Gmail account, and they are for the benefit of it. Google would not have included 2 steps authentication if it’s of no use. Never pray to become a hacker’s victim. Because if you do you may spend an extra fee to gain access to your account and that is even not sure. So, for the benefit of it, I have Gmail two-step verification set up already in my Gmail account but for the purpose of this article, I’ll turn off 2 step verification and start the whole process from the beginning on how to set up your account authentication. Note: If you want to take your online account including social networks such as Facebook, Apple, and the likes account more secure you should consider using 2 steps verification. Please, this procedure requires attention. Since you are setting up additional password outside the default password to secure your account you should pay core attention so you do not mess things up. Also, make sure you write your 2 step authentication password where you cannot forget it, it can be written in your personal diary, phone note with a password, but I’ll not advise you write it on a public note or where others can access it. 1. Fire up your browser and log in to your Gmail account. This is the first thing you need to do. The 2 step verification is backend tactics different from the usual way to change Gmail password. 2. 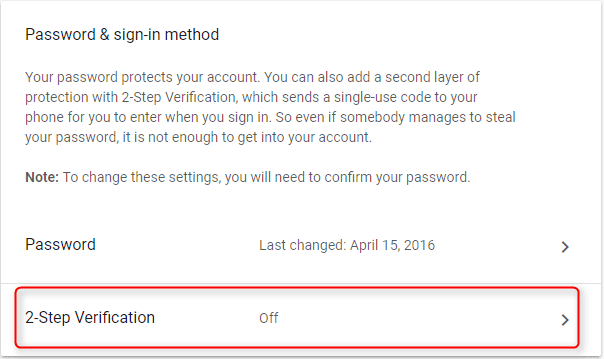 Instead of going straight to Gmail inbox, you will be taken to Gmail security section where you have the direct access to either turn-off two-step verification or turn-on 2 step verification. 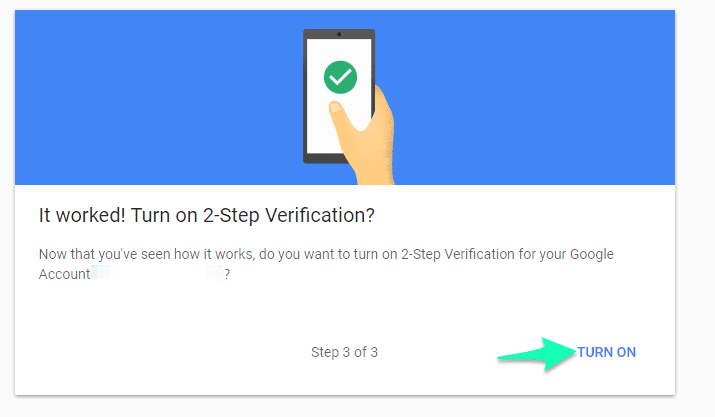 Click on the two steps verification icon and circled in the image below. 3. The essence of two-step authentication is to add an extra layer of protection to your Gmail account outside the default password protection we normally use. This will also give you additional control over your Gmail account and kick the bad guys, hack outta your way. Click on get started to enable the two-step features. 4. Here is exactly where we are going to. At this point, you will be asked to log into your Gmail account again. Don’t hesitate to login. The whole procedure is section into three. And it has to do with your account verification and personification. Don’t relax yet because we are not done yet. 4. Google will pop up phone number associated with your Gmail account and also prompts you to choose how to verify your account. For this purpose, we will choose for voice call over text message before I click on next button. 5. 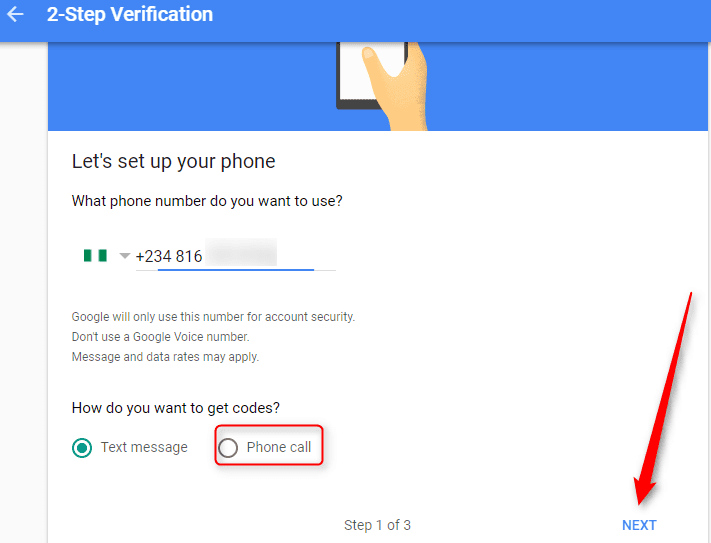 Google will put a call through to verify your phone number via a voice call and dictate your 2-step verification code to you. Note: If you have any phone linked to your Gmail account you should see the interface below. For quick access click on try now otherwise hit don’t use prompt. 6. 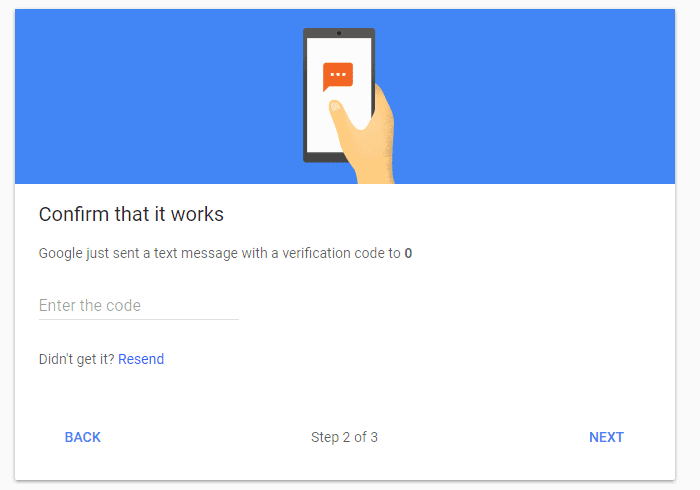 Enter your Gmail two-step verification codes sent into the code section as shown in step 5. If you, however, do not receive the code you can use the resend button for another code [if you choose message over a voice call. 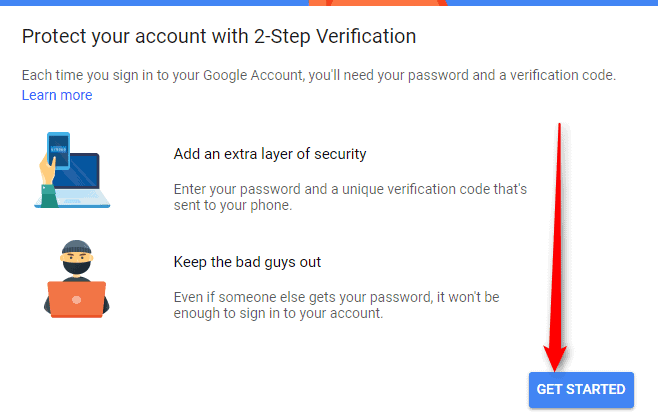 As simple as that you have successfully set up a Google 2 steps authentication for your account. The implication will be that you have to enter your new codes or password to your Gmail account whenever you want to log into your account. This is an additional way to escalate your Gmail two-step verification. If you have a phone linked to your Gmail account you will get a notification push on your device whenever you or anybody tries to log into your Gmail account directly on your phone leaving you with Yes or No option to allow access on your phone. Following through note 5 above you will get this kind of a push on your phone when you or anybody try to access your Gmail account. Interesting enough, you will not be able to access your Gmail account without authorizing it from your phone and it also means that without a network on your phone to trigger Google’s notification you will not be able to access your Gmail account.